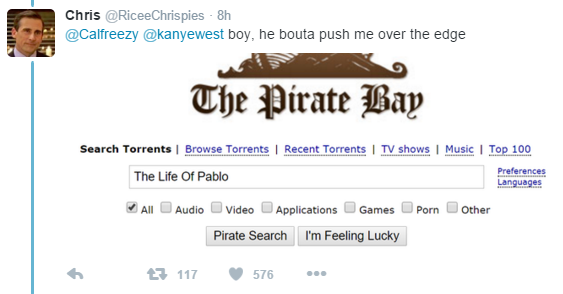 Kanye West's latest album is making headlines in the news, and this buzz is directly translating to various pirate sites. 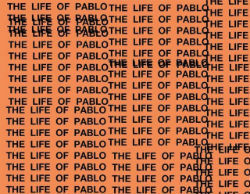 Over a half million people have downloaded a pirated copy of The Life of Pablo a day after its release, in part fueled by the album's limited availability. Kanye West has been dominating the news this week with a combination of absurd statements and the release of his new album The Life of Pablo. In a surprise move West released his album exclusively on Tidal and his personal website. This limited availability angered many fans who refused to sign up for an expensive monthly subscription. And even those who signed up for Tidal had issues getting their hands on the album. Tidal’s support desk has been flooded with complaints from people who failed to receive a copy due to issues with the service’s payment system. Then, a few hours ago, Kanye West fueled the controversy by claiming that his latest album will never be for sale. “My album will never never never be on Apple. And it will never be for sale… You can only get it on Tidal,” he wrote. Kanye’s statement received a lot of pushback from fans, several of whom had already noticed the various unauthorized copies of The Life of Pablo that have been floating around on the Internet. Soon after the album was released pirated copies started to populate many torrent and direct download sites, something many people on social media were quick to point out. TorrentFreak has been keeping a close eye on the popularity of the album on BitTorrent and after the first day an estimated 500,000 people have already grabbed a copy. The album is currently leading The Pirate Bay’s list of most shared music torrents by a landslide. At the time of writing close to 10,000 people were sharing a copy of the most popular torrent simultaneously, something we haven’t seen with a music release before. Aside from torrent sites, the album is also being widely distributed on various direct download services and hosting sites, increasing the overall piracy numbers even further. The Life of Pablo was a highly anticipated album which would have resulted in a lot of piracy anyway, but it’s safe to say that the limited release boosted these numbers significantly. On the flip side, Tidal most likely received tens of thousands of new subscribers, so it’s hard to draw any strong conclusions in terms of revenue. But perhaps Mark Zuckerberg can jump in if the results are disappointing. 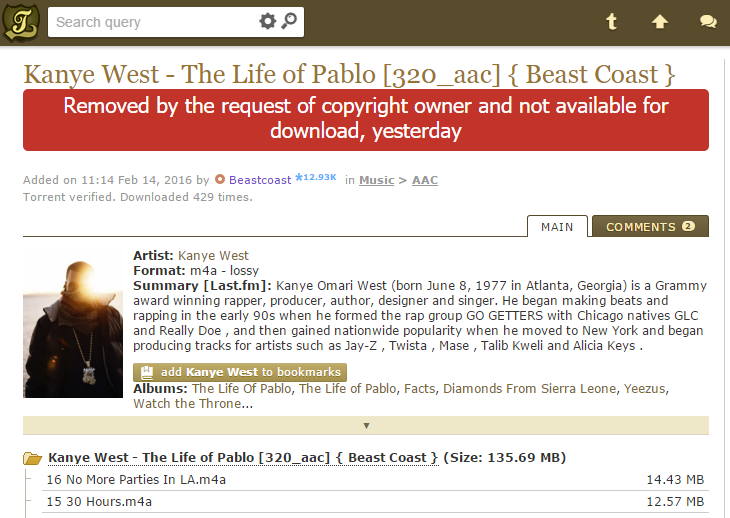 Thus far Kanye hasn’t commented on the piracy issue, but the RIAA is working hard to take links to pirated content down. Many of the torrents that were uploaded yesterday have been removed, but these are soon replaced by new ones.